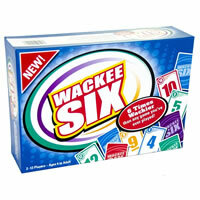 Wackee Six is a speed card game that is exciting and for anyone who likes to laugh or loves a good adrenalin rush. You'll also need to be a good team player. What makes this card game even more "wackee" is there are no turns - Everyone plays at the same time. Get the party started with this great fast paced card game for up to 12 people. Get started in no time and quickly learn the game rules and instructions. Tell us what you think about Wackee Six and be sure to grab it for your next get together today. If you're the first player to go out and call "Wackee Six" then you win. This game comes with 6 decks of 54 cards and the official Wackee Six game rules and instructions. Please keep in mind that the official Wackee Six dice-card rules and instructions could be different depending on the game version you have. The rules below are some of the exact directions on how to play Wackee Six. Share with us your comments, funny stories, tips, advice, strategies, creative ways to play, questions about how to play, problems with the rules or anything you want about Wackee Six. All submissions will be reviewed within 24 hours. Click here to add your Wackee Six comments.